Thai Hom Mali rice could lose market share in Hong Kong to Cambodia, where premium fragrant rice sells at more competitive prices. varieties mixed with jasmine rice. Hong Kong imports 220,000 to 230,000 tonnes, or 10% of the jasmine Hom Mali rice Thailand ships each year. But the volume of Thai rice to the territory has been falling in recent years, as Cambodia offers lower prices by shipping out of ports in Vietnam, Thai exporters said. country’s leading Hom Mali exporter. the first 10 months this year, the volume shrank 14% to 135,000 tonnes. Thai Hom Mali rice also must deal with fake Hom Mali being sold in Hong Kong and China. 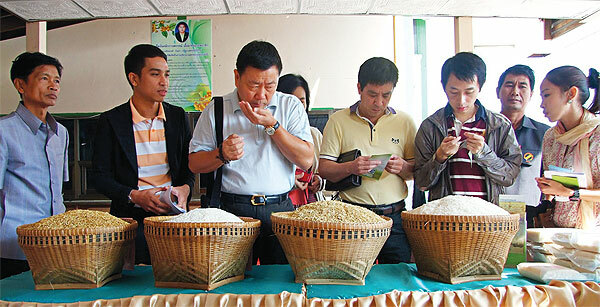 trademarks on bags of lower-standard grain, said Mr Charoen. Hom Mali exports have dropped to 1.82 million tonnes in the first 10 months of the year, down 14% from the same period of 2009. His company’s sales last year shrank to between 150,000 and 160,000 tonnes from more than 250,000 the year before. who don’t want to spend as much. He added the quality of Hom Mali rice, especially the aroma, has been deteriorating due to a lack of investment in research and development of rice breeds and the lack of a zoning system to ensure the grain’s properties. for growing Hom Mali,” he said. by Thai millers because of the Thai government’s income guarantee programme.